In August my wife and I had our first baby — Bradley. And with his arrival we went out and bought him all kinds of baby stuff to get his room ready. One of the key pieces of decorating his room was picking out his bedding. We picked a nice comforter set that coordinates his window curtains, changing table, pictures etc. The funny twist is that young babies should not have a comforter in their bed with them, so you spent all this money on a comforter you can’t use right now, what do you do with it? Don’t worry the marketing folks were on top of this — sort of. They sew a nice loop in the back which is designed for a curtain rod or similar device to hang the comforter on the wall, but nobody makes one sized for a baby. The curtain rods look ridiculous as they keep the blanket too far off the wall, I refuse to use two binder clips handing from nails, and standard quilt racks/shelves are all way too wide. I guess the baby marketing team was too busy selling us wipe warmers, bottle sanitizers of all sort, teething chew toys and novelty onesies. I’d use the same simple mechanism I used to hold my paper towels on my New Yankee Workshop Sharpening Station. It’s a simple solution that makes use of a dowel and two corner blocks to hold the dowel in place. One of the blocks has some wood removed so gravity will keep the dowel in place, but downward forces keep the dowel secure. To remove the dowel you lift that side straight up and it comes out via a path you have cleared for it. 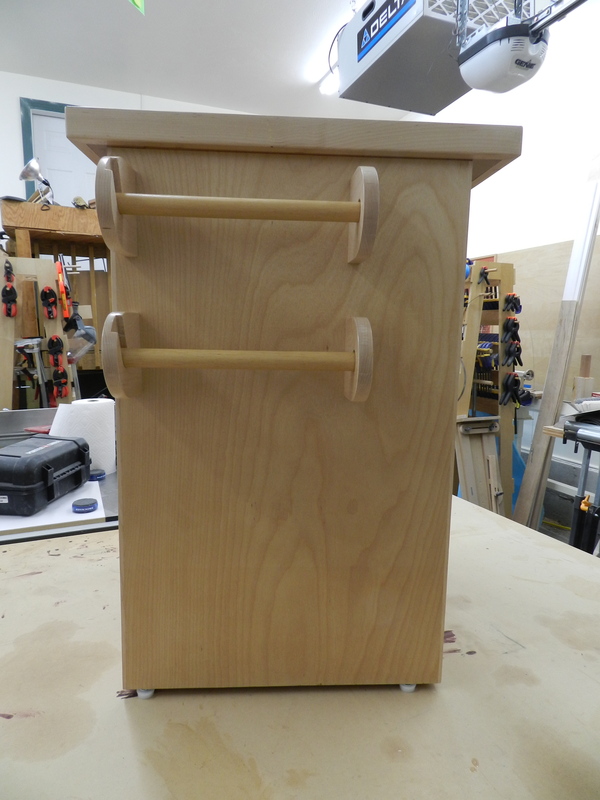 I used a 1 1/4″ diameter 36″ long cherry dowel and some cherry scraps (extra crib slats) to make the holder. The dowel is only about 3/4″ off the wall, so when the comforter is in place it hangs very close to the wall the way I wanted it to look. The corner blocks are carefully glued and screwed through the back. 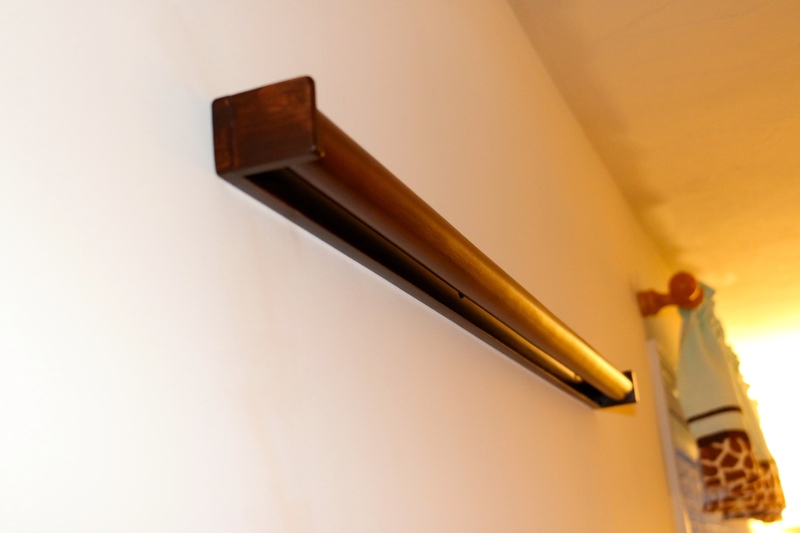 The holder is affixed to the wall via some countersunk screws that are hidden by the dowel when it is in place. Since I was using scrap wood, I used the thin 3/8″ cherry stock I had on hand, but if I were to build this project again I’d beef up those blocks some more. I used a Forstner bit in the drill press to drill out for the dowel and for the open ended side used a chisel to remove the extra wood. The finish is garnet shellac, followed by several coats of medium brown gel dye stain and finished with a few coats of semi-gloss poly-acrylic. When the comforter is put in place it completely covers the holder. The comforter is 2 inches wider than the 36″ pocket in the back so once on the wall the holder disappears. All in all it was a quick and easy project that solves a problem the baby marketeers haven’t gotten around to yet. 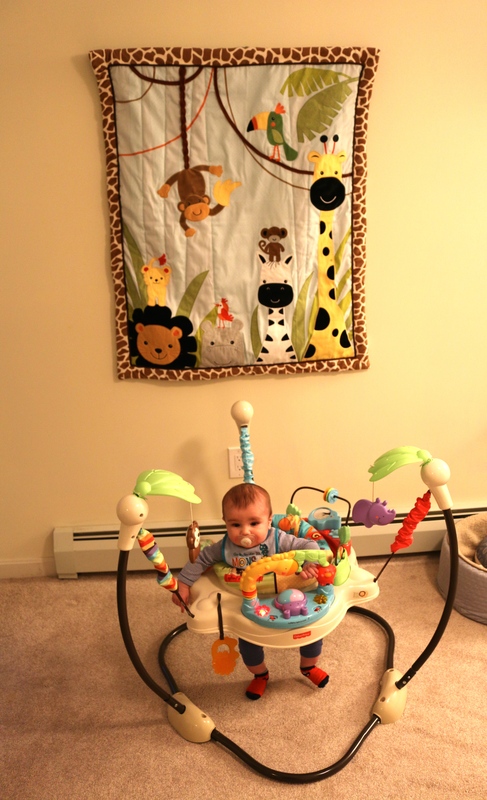 Bradley seems to enjoy jumping in his jumparoo and looking at all the animals on his comforter so I consider this project a success. If you wind up making your own version or have solved this problem in another way, let us know. That is one swanky bouncy seat! Nice solution Bill. It doesn’t overwhelm the quilt because it is hidden. It is a nice clean look and solves the dilemma of having a comforter that would otherwise have been placed in storage.